We’d love your help. Let us know what’s wrong with this preview of Courting Poppy Tidemore by Christi Caldwell. To ask other readers questions about Courting Poppy Tidemore, please sign up. Readers of Christi Caldwell have been waiting for the day that Poppy Tidemore got her HEA and she finally was grown enough to handle one Tristan Poplar! Catching a glimpse into the lives of all the Tidemores and their growing families was such a treat! I love that Poppy was the same spirited girl we met but older and more mature. I love that Tristan was the man who was worthy of loving her and I hope we see more of them in future stories. Thank you Christi Caldwell for making Tris Worth the wait! I'm so excited for this book! I've been waiting for Poppy to get her own book since she was a minor character in her four older siblings' book. I really ought to subscribe to Christy Caldwell's newsletter so I can get updates. I'm still waiting for Beatrice Dennington (another minor character in previous CC books) to get her own book! As for the bookcover...Hmm...I like the color of her dress but not so much her pose and facial expression. Poppy has been a character in many books, from her life as a child ,when we first meet her and she meets Tristan ,to present day and her life as an independent sassy adult. She’s such a character, that the whole of Christi’s community has been begging for her story. To join her finally with Tristan was a perfect dream , one I wholeheartedly applaud , this book was wonderful to read. In parts amusing, in others emotionally traumatic, this was one book that will stay in my memory and be read repeatedly. The two were made to be together no matter their troubles or trials , even though at times I wasn’t sure exactly how this was going to end , I never doubted Christi’s ability to give us a HEA . Additionally,It was so nice to see the rest of the Tidemore’s and their families, dogs and children included. Just when I think Christi Caldwell cannot outdo her previous story in pops a whirlwind known as Poppy Tidemore and Ms. Caldwell proves me wrong. Poppy Tidemore, the last single sibling of the notorious Tidemores. Poppy Tidemore – energetic, forthright, make your head spin Poppy Tidemore. Tristan Poplar, Baron Bolingbroke, has his own scandal that just may rival that of the TIdemores. When things come to light Tristan loses everything he holds dear. Family and friends work to help the two with their Just when I think Christi Caldwell cannot outdo her previous story in pops a whirlwind known as Poppy Tidemore and Ms. Caldwell proves me wrong. Family and friends work to help the two with their respective dilemmas but it may be their outrageous arrangement that helps them most of all. Courting Poppy Tidemore had me laughing, crying, and staying up way past my bedtime to finish. Definitely one of Ms. Caldwell’s finest stories to date. These two have belonged together for so long— how refreshing to finally read their story. Friends to lovers is the most fitting trope for this story. An easy friendship (crush) from Poppy’s childhood with her brother-in-law’s best friend morphs quite unexpectedly for him into a forever love. Pffff finally I have reached my weekend goal, I have read the three released books I wanted plus the unsuspected one I found back in my kindle shelves. Actually I have only read very few Mrs Christi Caldwell work, but each read has brought its cheer of excitement, fun and heartache. I have read none of the previous books in this series so everybody was new to me, but I took time to read the three extra bonus scenes which introduced Poppy and Tristan to me. There is no secret to say they are incredi Pffff finally I have reached my weekend goal, I have read the three released books I wanted plus the unsuspected one I found back in my kindle shelves. There is no secret to say they are incredible characters, honorable and loyal to the fault. Over time they came to share a strong friendship, and probably something more as it lets them free to share their deeper feelings and emotions together when they can’t tell them to the others. They have flaws, and the one which can torn them apart is their pride. They accept who the other is, but they also must do things their way. Tristan wants to restore his name’s honor but what is honor when it is lived alone. Has it enough value to have to cost the love of his life. And Poppy who lives through her art, can’t she face to see it judged, or does she prefer to play it safe and hide in the edges, never exploring her capacities. The 2/3 of their journey was light despite their scandals issues, it was how their unusual relationship evolved to a friendship to a marriage of convenience. But the last part had me on edge, arching for Poppy, hooraying when she decided to reach her dream, applauding because she stood for her even when arching and cheering as the last scene unfold as a revised flashback. I felt sad and sorry for Tristan too but he was the one who made the decision to estrange himself from his wife, but he won me back when he finally understood that when things have a cost, he must be certain of the price he was ready to pay for. Was honor and pride more valuable than love. An emotional journey - worth every wait!! Poppy and Tristan are quite well known to Christi Caldwell's readers, specially Poppy. Over the years we have almost seen her growing up in front of our eyes! And so, Poppy's book was a much anticipated one for me. But never had I imagined that Poppy's journey to womanhood would be so emotional, so enticing, so full of angst! This story will, on obe hand, make one laugh aloud, smile with affection for the girl who is so very unique, and the sweet relation An emotional journey - worth every wait!! Poppy and Tristan are quite well known to Christi Caldwell's readers, specially Poppy. Over the years we have almost seen her growing up in front of our eyes! And so, Poppy's book was a much anticipated one for me. But never had I imagined that Poppy's journey to womanhood would be so emotional, so enticing, so full of angst! This story will, on obe hand, make one laugh aloud, smile with affection for the girl who is so very unique, and the sweet relationship between her and Tristan, and at the same time will pull your heart strings and make you cry for all the injustice they have to face...the unexpected twists, the tension, and then again the love that was always there, as a stream flowing with strongest undercurrent, just hidden beneath the surface of friendship. Many earlier characters appear in this story naturally, and it only adds to the natural flow of the story, strengthens the bond of family that is always so distinctly present in Christi's story. And then this book brings forward the other subtle tone where women in historical romance genre also come forward to do something on their own. It is like a tribute to those real women who had actually dared to break the convention. We finally have Poppy's HEA and I for one couldn't be happier. For some reason this story reminds me of It's a Wonderful Life. Poppy has been infatuated with Tristan since she was a young girl. After being forced together during dueling scandals, Poppy and Tristan come to a marriage pact, marrying for all the logical reasons and denying their own feelings. Poppy is an eternal optimist, innocent and brave and devious all at once. Tristan is ever honorable and ever loyal, almost to his own detriment. I thought the way Christi Caldwell showed the evolution of their relationship from annoying little sister, to friends, to lovers and married couple very realistic. I loved how they both pushed and eventually supported one another. Tristan and Poppy Poplar, I'll love you til the day I die. Lol. Courting Poppy Tidemore is book 5 in The Lords of Honor Series by Christi Caldwell. I really enjoyed this book. I like how Caldwell writes about complex characters that are relatable. Poppy is one of my favorite heroines. She has made appearances as a young girl in earlier books. Now she is all grown up and causing scandals wherever she goes. Tristan is the amazing hero in this love story. He also appears as a secondary character in a previous book. 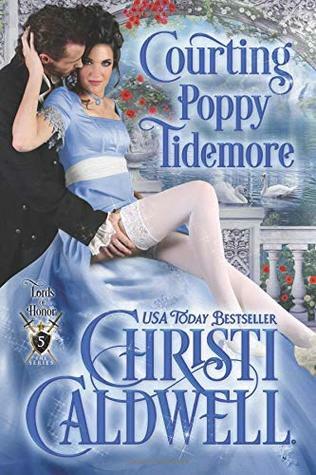 I liked his integrity and his honesty in the f Courting Poppy Tidemore is book 5 in The Lords of Honor Series by Christi Caldwell. I really enjoyed this book. I like how Caldwell writes about complex characters that are relatable. Poppy is one of my favorite heroines. She has made appearances as a young girl in earlier books. Now she is all grown up and causing scandals wherever she goes. Tristan is the amazing hero in this love story. He also appears as a secondary character in a previous book. I liked his integrity and his honesty in the face of great personal loss. Can’t wait to read the next one. While this can be a stand alone tale, knowing the rest of the Tidemore sisters makes it special. Poppy is the youngest and while all of her sisters created a scandal, Poppy’s is the biggest. Her hero has been Tristan, once a lord, but now a baron. His scandal is bigger than hers and not of his doing. But they have their marriage pact, and marry they do. Do you think Christi Caldwell will give us an easy HEA? Not this time. Christi manages to tear at your heartstrings with Finally, Poppy’s story! But we are getting ahead of ourselves because the beginning of this book doesn’t start out in a gentleman’s club! But over two years earlier in a quiet room at a ball, where Tristan Poplar, The Earl of Maxwell comes acro If you have read any of the Tidemore series, then you would know that the Tidemore's always seems to be in the center of scandal! And now there was only Poppy left, there was a bet on the books that is wasn’t a matter of IF Poppy was going to be embroiled in a scandal, but when! The first half was delightful but it started to drag on towards the second. But the chemistry between Tristian and Poppy was what made me read till the end. Christi Caldwell has created two loveable characters and created scenes between them nothing short of electrifying. Also, Can I hope for Caleb and Claire to be a couple? And more from the New Earl of Maxwell.? The youngest Tidemore sister, Poppy, finally gets her story. After watching sister by sister being ruined and finding love it was Poppy's turn. And who would be a better suitor for her than the family friend Tristan Poplar, formerly Earl of Maxwell not reduced to the Baron of Bolingbroke after a scandal is uncovered about how his parents stole the Maxwell title. While Poppy has always loved Tristan, he still sees her more as a girl and friend. When the 2 form a marriage of conveninece to help bot The youngest Tidemore sister, Poppy, finally gets her story. After watching sister by sister being ruined and finding love it was Poppy's turn. And who would be a better suitor for her than the family friend Tristan Poplar, formerly Earl of Maxwell not reduced to the Baron of Bolingbroke after a scandal is uncovered about how his parents stole the Maxwell title. While Poppy has always loved Tristan, he still sees her more as a girl and friend. When the 2 form a marriage of conveninece to help both of their scandals Poppy thought that would be enough but she needed more and her new husband was off the the army to try to regain some honor. Christi Caldwell has an amazing way of writing characters with feeling and reading about this couple is at times both heartwarming and heartbreaking. While each suffers in their own way, they are able to bring out the best in each other if only they would be allowed to do so. Poppy Tidemore is the youngest and last of the Tidemore girls. Her three older sisters had all caused a scandal of some sort and her brother, Jonathan Sinclair...known as Sin...had lived his nickname until he was tamed by the girls' governess. Which of course, also caused a scandal. And now, Poppy has followed in that tradition...just in a less traditional way. Tristan Poplar, Baron Bolingbroke's life has taken a bad turn. Very bad. Everything he'd thought he'd known of his life is shown false. He isn't even who he'd thought he was. And...he's lost everything and has to find a way to continue to care for his mother and two sisters who've yet to marry. He was known as a rogue...now he's known as something much worse. The reader can first meet Tristan in; Captivated by a Lady's Charm, Lord of Honor Series Book Two, the story is about his best friend, Christian, and Poppy's sister Prudence. At long last, Poppy! And I love her. She is all I ever dreamed of, and, while the romance runs a little rough, this is an adorable story. The characters are, on one hand, more than well known, and on the other, a wee bit mysterious. Their lives together are, to begin, based on mistaken assumptions, which eventually give way to understanding of each other...and thus, love. It was perhaps, a key down, in a superficial way. Poppy has been incredibly mischievous, always in trouble, even for POPPY!!! It was perhaps, a key down, in a superficial way. Poppy has been incredibly mischievous, always in trouble, even for a Tidemore. On the other hand, she needed a safe place. Her hero provides it. As usual, there are levels of story in this book. The apparent scandal - driven marriage, the deeper, long -term relationship that has existed...and the challenges of being each of them. What a Sweet Love Story!! Poppy is certainly one who will keep you on your toes to the end. She is still full of vitality and trouble as she was in her sisters' books. Tristan has always looked at Poppy as a friend since they were kids. He just didn't realize it could be more until she grew into a beautiful young woman. Poppy has been in love with Tristan since they were kids but kept her feelings to herself until she comes up with the marriage of convenience to help with the scandals. Be prepared to What a Sweet Love Story!! Be prepared to have your box of tissues close at hand. There are some teary eyed moments to deal with. I was enthralled with this book from the beginning and was disappointed when it ended. I just wanted so much more information about Tristan and Poppy but I know we will hear more later and look forward to the next book. I can only highly recommend this awesome story to everyone!! Finally we have Poppy Tidemore’s HEA, well worth the wait in the last of the Lord of Honor series. Poppy with her very independent nature, finds her love in Tristen Poplar, takes an author with great imagination to come up with that name to fit with Poppy. As a reader I have read so many of Ms Caldwell’s books mentioning Poppy, who I meant at a young age, always had an honest answer for all her sisters, and did not let me down in this her book, stayed true to herself. Wonderful finish to a series b Finally we have Poppy Tidemore’s HEA, well worth the wait in the last of the Lord of Honor series. Wonderful finish to a series but the end came so quick I can only imagine the author is ready with the next book, it was writing itself in her mind. When the announcement that Poppy’s story was coming soon, I read through all the the Tidemore romances. I’m glad that I did. And there are unpublished excerpts of Poppy and Tristan, as well. This is a story of chance meetings, friendship, personal honor, and self determination. And the affection that ties it all together for these two characters. Enjoy! Caldwell consistently crafts compelling stories of people trying to be true to themselves. Many are see as scandalous or wallflowers or rogues, living their livestock the edge of polite society. Reading about the final Tidemore was bittersweet. I have been waiting for Poppy's story and it delivered. Her spirit and heart were so enthralling you couldn't help be want to be in the room with her. Tristan was such an honorable, vulnerable character and their relationship was frought with so much emotion I could hardly breathe. I hope we get to see more of this couple and all the Tidemores in the future. Excellent!! As I said in my Amazon review....Caldwell could write a grocery list and I would enjoy it immensely. Loved Tristan and Poppy's story but the only problem is that I wanted more. I didn't want it to end, at all. Can't wait for her next tale. I'm sorry I never write a synopsis/mini description of what's going on. I do tell you that I enjoyed it and to buy it!! You won't go wrong it if you've enjoyed previous books by Christi Caldwell. I loved this one! Ok, so I’ve loved them all!!! Poppy was such a great character and her love for Tristian was amazing. It took awhile for Tristian to figure it all out but I’m so happy with the end. I’m very interested to see if we meet this new Maxwell and if anything will happen between Chloe and Mr. Gray. It seemed there was a little tension between the two. I had to deduct a star due to the number of times I was angry with Poppy in this book. My heart broke for Tristan and his sisters. Now I anxiously await the next story as the lack of an epilogue tells me there is so much more to come. USA TODAY Bestselling author CHRISTI CALDWELL blames Judith McNaught's "Whitney, My Love!" for luring her into the world of historical romance. While sitting in her graduate school apartment at the University of Connecticut, Christi decided to set aside her notes and pick up her laptop to try her hand at romance. She believes the most perfect heroes and heroines have imperfections, and she rather USA TODAY Bestselling author CHRISTI CALDWELL blames Judith McNaught's "Whitney, My Love!" for luring her into the world of historical romance. While sitting in her graduate school apartment at the University of Connecticut, Christi decided to set aside her notes and pick up her laptop to try her hand at romance. She believes the most perfect heroes and heroines have imperfections, and she rather enjoys torturing them before crafting them a well deserved happily ever after!